From the last couple posts you might think I haven't been having a good time in Russia. That is not the case. For instance, last night we went to a restaurant called Cafe Margarita, named after the protagonist from Bulgakov's amazing novel Master and Margarita. 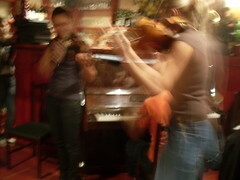 The cafe was across the street from Patriarch's Pond (where Master and Margarita opens) covered in art depicting scenes from the book, and a live band composed of two violins and a piano played riotous Russian dance music as the increasingly drunken audience called out numbers and cheered. Though I ordered myself a Sprite, people seemed to keep buying me vodka, and the next thing I know I'm at the piano playing Ziggy Stardust. We made friends with some Texas tourists who were driving their way across Eastern Europe, and some Georgians took my phone number and promised to call me when they came to America. 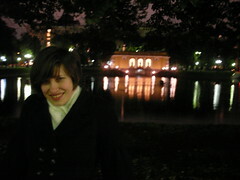 Marina in front of Patriach's Pond. I take pictures better when drunk out of my mind. 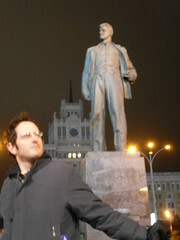 Mugging in front of the statue of Mayakovsky on the way home from Margarita. This is a country that appreciates its writers. And builds statues of them. Lots and lots of statues. I like that.